(A) Commercial quality with “Webbing reinforced” type construction in custom sizes and colors. Sewed with “Solar Fix” thread. These are just as strong as the cabled sails and easier to install. In most cases we prefer our customers to use these type. (B) Commercial quality with Stainless steel cabled perimeter and extra reinforcement. Made to fit the space. Requires some skill during installation. Continuous cable with clamps Sewed with “Solar Fix” thread. 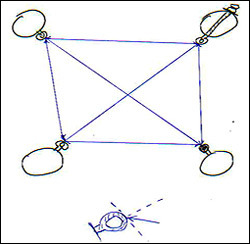 Continuous cabled sails often require extra “D” shackles to fit their larger corner rings. Why do a Custom Sail? They are easier to install because they are made to fit the space not the other way around. This means less messing around with hardware pieces trying to get them to fit. Just measure from fixing point to fixing point and the sail is made to fit. 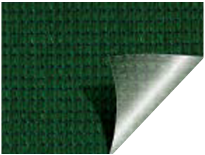 Custom sails are made to commercial quality standards which are much stronger and more durable. Why our Shade Sails are the best? 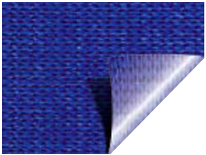 To achieve that taut tensile fabric look, you need to start out with a sail that is properly made and installed correctly. Don’t be fooled by catalog sails that hang limp. 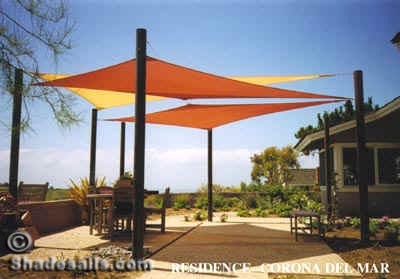 These Shade Sails are not available anywhere else. Also, look at the hardware “they” offer, then look at ours. Our hardware is intended for tension loads and is load rated”. Their’s is intended for a picnic. We have pull tested our sails at over a ton of force. Combined with our “load rated” hardware the systems we offer are designed to give you a trouble free installation. These are serious tensioned-fabric structures not a picnic tarp!! We are confident that these are the best quality and strongest Shade Sails on the market today. Monotec fabric comes extra wide. This means No Seams! Our Custom Sails are made with “Monotec” 370 brand fabric. This is the strongest and best Quality HDPE Fabric on the market. No other ready made on the market comes close. 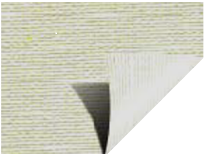 Monotec 370 fabric – Has round mono-filament fibers which means it stays cleaner and is easier to clean. All monofilament with no tape filler is 3 times stronger than mono/tape type cloth. It’s positive memory yarns require no re-tensioning. Monotec 370 is made in Australia not China or Indonesia. Ultra strong Marine Grade Stainless Steel Corner Rings. Our Custom Sails are sewn with Solar Fix thread that is warranted for over 10 years against UV breakdown. This thread cost 100X more than normal Dacron Polyester. But skimping on thread quality is what most our competitors do. 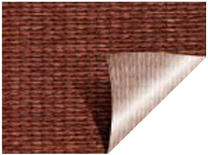 Heavy Duty Polyester (seat belt) webbing reinforced edges and corners. No need for added cable. (We also offer cable reinforced sails. Installed properly to a well engineered structure, these sails can withstand 85 mph winds. See Custom Fabrics ..click here..
GET A QUOTE OR ORDER(click here)…Our unique automated quote/ordering system makes it easy to get our best pricing and helps prevent problems like transcription errors. Simply enter your dimensions on this on-line form to get a quote or go all the way to the end to order a custom sail. The automated form also prompts you through the process which speeds up getting a custom sail by days. All our customs sails include Free Shipping. 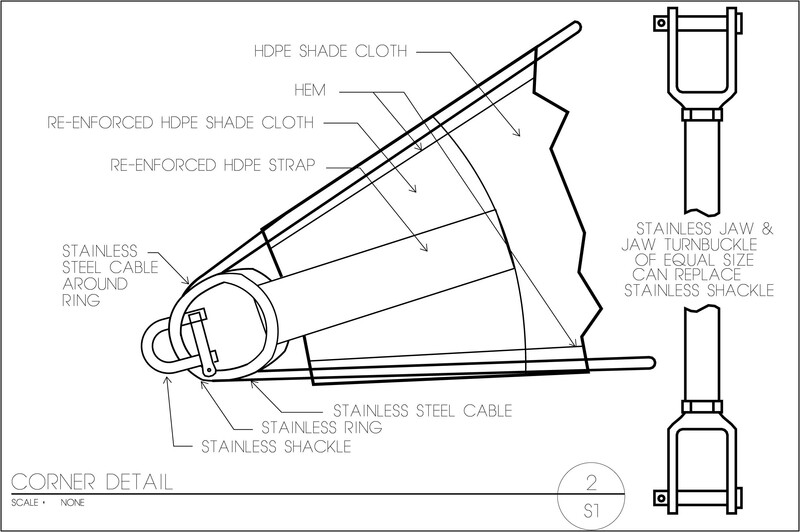 1) (Recommended) The Custom Sail includes turnbuckles and shackles and is adjusted to fit the space. 2) The sail is simply Made To the Dimensions you provide. This option does not include any hardware. 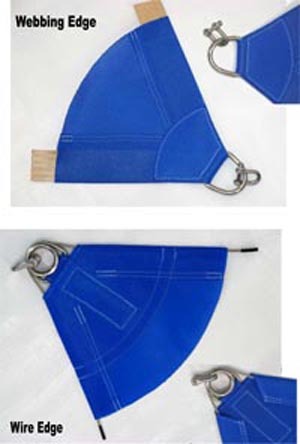 For the a Custom Sail made to fit your space…includes turnbuckles + shackles and is adjusted to fit the space. 1) Plan your installation. Check with your local building Dept. Many installations require a building permit. We are not responsible for obtaining permits or for engineering your installation. 2) To Help you visualize the Sails, you can use string stretched between your planned attachment points. Remember the sail do not have straight lines at the edges, they are constructed with a gentle curve that deflects about 10% over the length of each edge. We have found the best looking installations have bold changes in height from one corner to the next, and that overlapping sails or multiple sails give a more interesting look. 3) The attachment points should be installed first. Then the sails are made to fit. Therefore, install your posts with eye bolts, plates, eyes or straps to the house, tree or whatever you have chosen to support them. Remember, there can be substantial wind loads. (from 10 to 18 lbs. per square foot of sail). The sails have stainless wire or heavy webbing around their perimeters and can handle high wind loading. These loads are divided between the corners, but it is important that what they attach to be adequate for the loads they can produce. For our posts, we usually start with 4″ schedule 40 steel pipe (galvanized) or temporary power poles (treated) that are 6″ or larger for our posts. They are usually embedded in a concrete footing, 3 ft. to 6 ft. deep and 1 ft. to 1.5 ft. in diameter. As the sails get larger or higher then the post size should be larger. We can provide engineering services (for a fee) to determine these details. Corners of buildings are excellent attachment points and we have designed a special corner clip for that application (see hardware page). Also, it is often possible to connect to remote structures with wire spanning the distance but this should only be used to extend one corner of the sail any significant distance. 4) The sails have a stainless steel ring at each corner that must be attached to your fixing point. This can be done in a variety of ways; the best method is to use “D” shackle and turnbuckles. 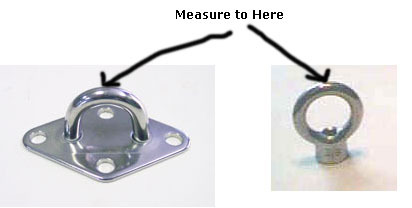 When you have your measurements we will make recommendations as to what attaching/tensioning hardware to use and their locations. 5) Measure accurately from the outer edge of the eye of one attachment point to the next. On four sided sails we need diagonal measurements as well. Also supply us with the heights of the fixing points. With the made to fit your space option we supply the marine grade stainless steel shackles and turnbuckles to attach the sail to the fixing points or eyes.. Therefore it is essential you use our eyes or fixing hardware so that we can be sure that our turnbuckles etc. fit onto the eyes without extra pieces. To insure proper fit of a custom sail you must follow the directions. First, you have to install the fixing points (eyes). Estimating their size and location is not enough and will result in a bad fit. This means the posts must be in the ground and their eyes or fixing points installed. Use our hardware. Using other hardware can often create problems with compatibility. The hardware we sell is compatible with each other. That is the turnbuckles, shackles and eyes all fit together and are also sized with similar load ratings. If you use a non-compatible component you may need additional components to “bridge the two and this will also cause a misfit. Using welded pad-eyes can be accommodated, but specialty shackles (long or twisted) may need to be added, usually adding to the cost. 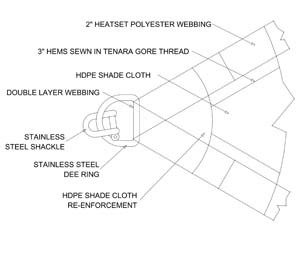 To guarantee proper fit, you need to measure the space the Shade Sail and hardware will occupy. That is to say the space between the fixing points. Therefore, measure from the outside of each eye at its apex that faces the center of the sail. Do not… measure from inside the eye or the face of the post!! Generally we use 2 turnbuckles on triangles and 2 on quadrilaterals which are included with the sail when you choose the Adjusted and made to fit option. GET A QUOTE OR ORDER (click here)…Our unique automated quote/ordering system makes it easy to get our best pricing and helps prevent problems like transcription errors. Simply enter your dimensions on this on-line form to get a quote or go all the way to the end to order a custom sail. The automated form also prompts you through the process which speeds up getting a custom sail by days. We have limited stock of the Blue, Green, Ochre and Natural waterproof fabric. There would be one welded seam through the center and stitched hems. Enter dimensions on this on-line form to get a quote or order a custom sail. Blue, Green, Ochre and Natural. Shade sails made in waterproof fabric have the potential to pond or pool ( hold water ) ! No responsibility will fall on the manufacturer or supplier in the event of this happening. The customer and/or installer must ensure all posts and fixings are adequate to achieve constant tension and that the fall angle(s) is sufficient with the finished sail to avoid this happening. This mesh is the Gale product -Com 95 with a laminated plastic backing. This backing makes the fabric waterproof and it also restricts the stretch of the fabric quite a lot. Not all shapes or sizes will give good results. Contact us if you need advice. Note, Custom Sails larger than 80′ around the perimeter are only warrantied against flaws in workmanship and materials for one year. Sails with perimeters greater than 80′ around are not warrantied for any specific life span or longevity. See warranty information for more details.